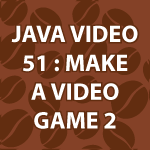 Here I continue what I started in Make a Java Video Game. If you haven’t seen it, watch it before this video. I’ll now create the GameBoard class that will animate all of my asteroids. I redraw the board using threads. If you are rusty on them, check out my Java Thread Video Tutorial. The code follows the video and should be used to help you better learn this material.